I've recently stumbled onto a very interesting Facebook application called Nexus. 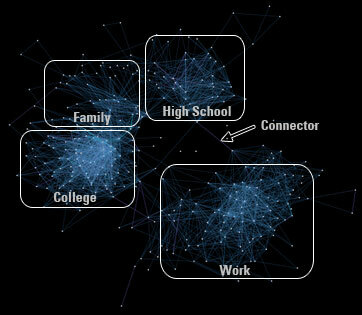 Nexus allows you to create a visual map of your Facebook Friends and their connections to each other. Once you've installed it, you click a button to launch it and it polls your Facebook data, then creates a dynamic map of your social structure (as defined by your Facebook connections). You are redirected to another site, and you are presented with a clickable model of your Facebook data. You can click on a friend and all of your mutual friends are highlighted. It also presents you with associated metadata to show the number of ways in which they are connected (directly or via membership to groups/events). Initially, what interested me was seeing how they were clustered. With a few exceptions, the nodes in the model seem to indicate the domains represented by the rounded rectangles above. There is a cluster for my current work relationships, one for college, one for highschool, and one for my friends from college. Interestingly, the college cluster is the most tightly bound. Those friends tend to know more of my other friends from college. Not surprisingly, High School is les populated than College is. Those friends are a bit slower to reconnect than my college friends. Secondly, what interested me are the lines between clusters. I've labeled one of those Connector above. That line represents a friend of mine from High School who directed one of my colleagues at Work in a play. There is a definite "small world" effect that comes into play here. One of my Facebook friends is a person I met because she was a colleague of one of my High School friends. Every so often, I will pick a Facebook friend and poll their friend list to see if there's anyone I know. When it was this person's turn, I noticed a familiar name. I remembered that person as an R.A. in the dorm where I lived my freshman year in college. Just to check, I browsed her friend list and, sure enough, one of my college friends was in her list. I friended her and now she is one of those lines joining clusters. Turns out, she shared a day care provider with my friend's colleage. Small world indeed. It would be even more interesting if Nexus could capture one level deeper and represent possible hits in a predictive manner. Show that person A is connected to person B by a likely acquaintance. I know the Facebook "People You May Know" feature runs on that algorithm. It would be interesting to see who these people are that join your other friends - and even more interesting if you turn out to know them.